1,2. Anti-TrkB (extracellular) Antibody (#ANT-019), (1:200). 3,4. Anti-TrkB (extracellular) Antibody, preincubated with the control peptide antigen. 1. Anti-TrkB (extracellular) Antibody (#ANT-019), (1:200). 2. 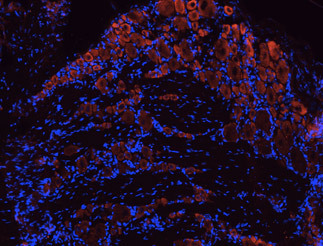 Anti-TrkB (extracellular) Antibody, preincubated with the control peptide antigen. Immunohistochemical staining of rat dorsal root ganglia (DRG) frozen sections using Anti-TrkB (extracellular) Antibody (#ANT-019), (1:100). TrkB (red) is expressed in DRG neurons. Hoechst 33342 is used as the counterstain. ___ Cells + Anti-TrkB (extracellular) Antibody (#ANT-019), (1:25) + goat-anti-rabbit-FITC. Cell surface detection of TrkB in live intact rat pheochromocytoma PC12 cells. A. Extracellular staining of cells with Anti-TrkB (extracellular) Antibody (#ANT-019) (1:50), followed by goat anti-rabbit-AlexaFluor-594 secondary antibody (red). B. Live view of the cells. C. Merge of the two images. Schaich, C.L. et al. (2016) Auton. Neurosci. 197, 1. Scott, A.L. et al. (2015) J. Physiol. 593, 3281. Anti-TrkB (extracellular)-ATTO-488 Antibody (#ANT-019-AG). A fluorescent labeled primary antibody. It can be used in immuno-colocalization studies in conjunction with any of our antibodies raised in rabbit.